Welcome to the Hong Kong Street Markets! 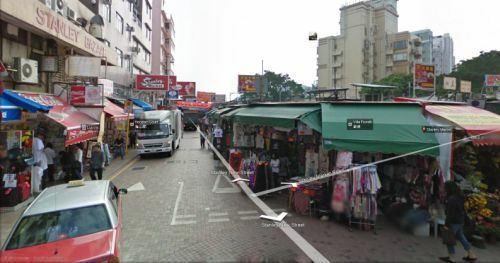 Here's a virtual tourist guide in getting to the most popular Hong Kong street markets, open-air markets or theme shopping streets such as jade market, stanley market, temple street night market, ladies' market and more. This Hong Kong shopping attraction offers a whole variety of items sold for bargain prices. Hong Kong street markets attract many tourists for shopping specially if you are looking for something exclusive, hand made accessories, clothes, antiques, electronics, souvenirs and a lot more. It offers a whole variety of items sold for bargain prices. Please do bargain because if you don't, they think you're stupid. The best time to visit these open-air markets is during noon till evening. Vendors might sometimes be tricky, so if you decide to buy something, first try to negotiate the price starting at half or below as tourists are often charged more than a regular price. A wide range of outdoor dining areas can be easily found in these street markets, with restaurant staff trying to lure you in to eat at their establishment. Here are the most popular Hong Kong street markets or open-air markets along with these theme shopping streets all over the city. Ladies' Market. Located in Tung Choi Street (South section), Mong Kok - opens daily from 12:00 noon until 11:30 pm. Here's a video to give you insights about how it looks like when doing shopping around Ladies' Market. How to get there? Take MTR trains to Mong Kok station then take Exit E2. Follow directional signs to the Ladies' Market at Tung Choi street south about 5 minutes walk. Stanley Market. Situated in southern part of Hong Kong island and one of most visited street market in HK. 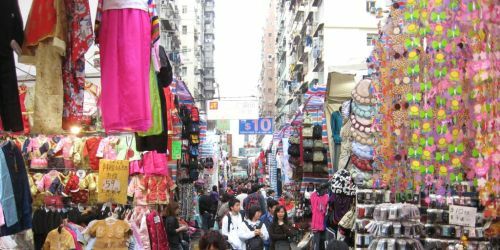 A must-visit street market in Hong Kong where you can find many interesting array of shops selling silk garments, sportswear, Chinese artwork, Chinese costume, jewelry, and souvenirs. Here's a tour and shopping video in Stanley Market to give you insights about how it looks like. * NWFB 66 (50 minutes @ HK$8.9). This bus route offers a very scenery ride, like passing through the popular Repulse Bay beach before getting to the Stanley Market bus stop located at Stanley Village Road after Stanley Beach Road (opposite Stanley Market and after Stanley Beach Road) close to the Stanley street market. Temple Street Night Market. Opens daily from 4 pm until midnight. Named after the Tin Hau Temple adjacent to the street and very popular among the street night markets. This is the right place if you are looking for anything like electronic gadgets, clothing, pens, watches, toys, and actually, it offers a bit of everything. This open-air market is also famous of Cantonese Opera performances, local foods, fortune-telling and portrait painting. 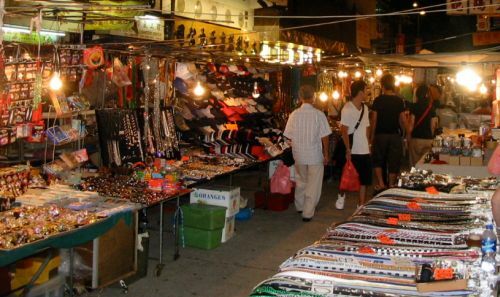 It is ideal to visit Temple street night market when the sun goes down as this place is vibrant at night. Here's a video to give you insights about how it looks like when doing shopping at Temple Street Night Market. How to get there? Take MTR trains to Jordan station then take Exit A. Follow directional signs going to the Temple Street Night Market (see map below). Hong Kong Jade Market. Corner Kansu St., Reclamation St., and Battery St. Opens daily from 10:00 am to 5:00 pm. This is where to go if you are looking for any types, shapes, and sizes of Jade at negotiable price. Be cautious also especially if you wanted to buy an expensive Jade item, unless you know exactly what you are looking at or you come with a person who is Jade expert, it is possible that will pay more than what actually the item is worth, and not all items on sale are genuine jade. 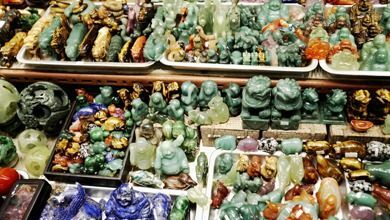 Here's a video to give you insights about how it looks like when doing shopping at Hong Kong Jade Market. How to get there? Take MTR trains to Yau Ma Tei station then take Exit C. Follow directional signs going to the Jade Market (see map below). It only takes about 8 minutes walk.